Vekel the Man is the Nord food vendor and bartender at the Ragged Flagon, which he owns. He has 100 barter gold and sells cheap food and ingredients. Although you can't fence him any stolen goods, as long as you're part of the Thieves Guild he doesn't mind if you steal objects from the tavern. He is in a relationship with Tonilia but is frustrated both by her engagement refusals and the rumors of an affair she allegedly has with Brynjolf. 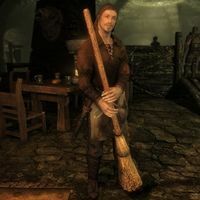 Vekel will always be found offering his services in the Ragged Flagon while he waits behind the counter, gives it a scrub, or sweeps the floor. He wears some common barkeep clothes and shoes. He also carries a belted tunic and a leveled potion of restore health, magicka or stamina, as well as the odd trinket or two. He is armed with a leveled dagger and war axe (both up to elven quality). The Ragged Flagon's bouncer and Vekel's good friend Dirge will inform you to behave around Vekel: "Vekel doesn't like strangers snooping around the Flagon. ", "Last person who made trouble for Vekel ended up with a smashed head." and "The last person that made trouble for Vekel ended up floating in the canal... catch my drift?" "You better have coin to pay for your drinks. There's no handouts here." "Got a lot of nerve coming down here. People tend to get hurt in the Ratway." "I wouldn't stay here long if I were you." "There's a reason the city guard doesn't come down here you know." "Don't make trouble or else I'll ask Dirge to 'walk' you out." "So, you're Brynjolf's new protege, eh? Don't look like much to me." "Something has to change soon or I may as well pack this place up and leave it for the skeevers." "Less coin in everyone's pocket means less coin in mine." "I hear even the simple jobs are becoming difficult. It never used to be like this." "It's been a long time since anyone joined us. Seems like people are in a rush to leave." "It's one thing to say you've got the skills to be a thief. It's another to actually use them." If you get kicked out of the guild, he'll refuse to talk to you: "I'll serve you after you've paid Vex." If you ask him for work, he'll tell you about some journals he's been looking for: "Now that you mention it, there is. I have a buyer with, shall we say, a very odd taste in literature looking for some particular books. I'm told they're the ravings of a madman... a wizard named Arondil and his peculiar cravings. It's said to be spread across four volumes and very hard to come by. My client is offering quite a reward for them, which I'd split with you." If you inquire as to the journals' existence, he'll reveal: "Recently, a woman was found... naked and shivering along the road to Dawnstar. The only information the guard could get from her were tales of strange experiments and Arondil scribbling in his journals." Asking about the man himself won't net you much: "Only rumors. He used to have a home in Dawnstar until they burned it down. The people say he was doing unspeakable experiments on reanimation... rituals only a necromancer would perform. After he made for Yngvild, he was never heard from again." Should you agree, he'll be pleased: "Then we have a deal. In his later years, Andoril [sic] moved into some ice caves known as Yngvild. He prefered [sic] the solitude in which to perform his, um... experiments." If you tell him you're not interested in books he'll scoff: "Yeah, but you're into gold. Let me know if you change your mind. I'm not going anywhere." If you already have all the volumes he'll be astounded: "I can't believe it. You have them already? Here, take this. This should cover your end of the work nicely." Finally, if you only have some of the journals he'll spur you on: "It's a good start, but you need all four of the volumes or the set isn't complete. Why don't you head back out to Yngvild and find the rest?" Once you return, he'll reward you with a leveled enchanted one-handed weapon: "Good. I was hoping you hadn't forgotten about it. As promised, here's your payment for bringing them to me. Got it as part of a fair trade from my client." "Lot of people looking for him. Don't know his name, but he's paid good money for nobody to know he's down here." "Well... when you put it that way, I think I do know the old guy you're talking about." or "Big talk for someone with a light purse." "Maybe I'm just getting soft in my old age, but I actually believe you." or "That's a touching story. Now get outta my face." "There's no need for that. Not like he's a friend of mine or anything. Just calm down." or "You've got a lot of nerve. But not a lot of common sense." If you press him to tell you who else is looking for Esbern he'll confide: "Dangerous-looking elves who didn't give their names. Draw your own conclusions." "Sure. How about you mind your own business about it, and I won't have to get Dirge to toss you into the cistern?" "I don't know you so we've got nothing to talk about. How about you finish the job Brynjolf gave you, then we can talk." "I don't know about the others, but I sure am glad to see a fresh face down here. The Flagon used to be packed every night with the boys from the Guild but now look at it. Last few years have been pretty bad. I've almost closed this place up." "Well, you did something Vex couldn't do at Goldenglow, so you're looking pretty damn good. Word is that you found something while you were out there though... something that could be a problem for the Guild. Just watch your back and do what Mercer says... he'll sort it out." "Maven was down here right before you got back and she was all smiles. Haven't seen her like that in a long time. Whatever you did at Honningbrew, you're now on her good side. Best of all, if she's happy, Mercer's happy. Keep it up and you'll go places." "Glad to hear Gulum-Ei got what he deserved. That lizard owes me big for a bad shipment of Shadowbanish Wine he tried to pass off on me. Mercer's been storming around waiting for you to come back. I think he's finally figured out who's been messing with the Guild. Never seen the guy so angry. Better help him out any way you can." "Everyone's been worried since you and Mercer haven't shown up in a while. Brynjolf even went out to find you. Delvin and Vex have been running things for now. I hope this all gets straightened out soon or I'm headed on the first caravan out of Riften." "Look, I like you, so I'll tell it to you straight. Brynjolf and the rest are in the Guild, and they're ready to cut you down. I know you have a damn good reason for siding with Karliah, so I hope you can give it to them." "The word is that Mercer Frey is a dead man. The Guild wants his blood. I can't say I blame them. Murder is not our way. Gallus was before my time, but I still can't believe it. You need to teach him a lesson... show him the penalty for betrayal around here." "So, word has it you and Brynjolf know where Mercer's hiding. Good. Make sure you make him pay for what he did to Gallus... heck, for what he did to all of us. We're all behind you, friend. Do your best." "I haven't seen so much celebrating in years. Mercer's dead, we have a new Guild Master and things are finally looking up. I only hope we can restore the Guild to its former glory after all the damage that's been done." "I haven't seen so much celebrating in years. Mercer's dead, we have a new Guild Master and things are finally looking up. Business is booming, coin is flowing and everyone seems content as things keep going our way. A new chapter in the Thieves Guild is being written this day and we all owe it to you. Many thanks." Vekel can be heard having random conversations with the other regulars of the Flagon, as listed below. Vekel: "Dirge! Did you take out the trash like I asked?" Dirge: "Yeah. Threw it in the lake like you said." Vekel: "Tell me you looked through the trash before you did that." Dirge: "Take it easy, Vekel. How long we known each other? Yeah. I checked it. All the stuff is in the safe." Dirge: "Job's done, boss. Gave the package to her just you said." Vekel: "Good. Did she say anything we need to know?" Dirge: "Yep. She said that the Jarl was planning a surprise raid on us, but she talked her out of it. Said she saved us a lot of trouble." Vekel: "That she did. Very good. I'll tell Brynjolf." Vekel: "Why can't you just settle down and run the Flagon with me?" Tonilia: "I don't want to settle. I like things the way they are." Vekel: "Come on, Ton. Marry me. Let me take care of you." Tonilia: "I can take care of myself." Vekel: "Look, I need to know. What's going on between you and Brynjolf?" Tonilia: "How dare you! After all we've been through together? How can you do this to me!" Vekel: "Hey, hey. Sorry. I just get jealous when I hear rumors about you." Tonilia: "That's all they are... rumors. So quit worrying." Vekel: "All right, Delvin. What gives with that case of Shadowbanish you sold me?" Vekel: "Sure, it tastes great. Only one problem. You said it can make the darkness as clear as day when you drink it. Guess what? It doesn't." Vekel: "Well, if some Moon Sugar should fall into your lap..."
Vekel: "Well if it turns up, I'll be willing to buy." Despite his claim that "Business is booming, coin is flowing and everyone seems content as things keep going our way. ", after the player is named Guild Master, he will switch back to his default dialogue after that point, complaining about the sorry state of affairs the guild is in. In the official game guide, it is revealed that he resided at Honorhall Orphanage at one point in his life. Esta página foi modificada pela última vez à(s) 10h04min de 22 de julho de 2015.